What's the best method for determining the density of solids? The best procedures for density determination of solids are the buoyancy and displacement methods, both of which are based on Archimedes' Principle. Prerequisite for these methods is the use of a liquid with known density that does not react with the sample material, but wets it thoroughly. A wetting agent can be added to the liquid. Do I need to use a density meter to measure density? No, you can quickly convert your laboratory balance to measure density with a Density Kit. The Density Kit can be mounted on your balance in a few simple steps. There are lots of steps in the density measurement procedure. How can it be simplified? The integrated balance application provides step-by-step instructions. Excellence level balances have workflows for 5 different density determination methods. Advanced and Standard level balances have workflows for 2. What do I need to determine the density of liquids? In conjunction with the Density Kit, the optional 10 mL glass sinker enables you to determine the density of liquids. The difference of the weight of the sinker in air and in the liquid is used to calculate the density. Alternatively, a pycnometer or digital density meter can be used. The density of my sample is less than water – it floats! The weighing basket on the Density Kit can be inverted so that lighter samples are held under the liquid and cannot float to the surface. If you experience that the buoyancy force is greater than the basket apparatus, place an additional weight on the top weighing pan of the Density Kit and restart the density determination procedure. Alternatively, use a different reference liquid with a lower density. I have problems with lots of bubbles on my sample. Add a few drops of wetting agent to the reference liquid. Leave it standing overnight to release any dissolved gas. Use a soft brush to brush the bubbles off the sample and the Density Kit. Which balance do I need to use to get accurate density results? The accuracy of density measurement is influenced by the tolerance of the method (air bubbles etc.) and the temperature measurement as well as the accuracy of the weight measurements. Every measurement on ANY balance is subject to uncertainty. Understanding this uncertainty is the key to ensuring accurate weighing results. It is not the readability that determines the accuracy of a weighing instrument, but rather its repeatability and the minimum net sample weight. I have to determine the density of solid plastic samples and need to comply with ISO 1183-1. Which balance or scale can I use? ISO 1183-1 compliance requires a balance with a readability of 0.1 mg or less and specifies that the sample should preferably have a mass of at least 1 g. Weighing samples of at least 1 g on a balance with readability 0.1 mg will not generally violate the minimum net sample weight requirement of the balance. The required balance accuracy however, should be considered in conjunction with your required process tolerance. Our free GWP® Recommendation service can help you select the right balance for your specific needs. I have problems to follow the complicated procedure. There are several steps in the density measurement process, and sometimes you need to wait a while for the balance to settle so it can be easy to get lost off, especially when you are busy with multiple tasks. The integrated balance application provides step-by-step instructions. You confirm each instruction by pressing the OK button, so you always know where you are. How can improve traceability of my density measurements? Connect a barcode reader to your balance to enable meta-data, such as sample ID, lot number and order number etc. to be read-in directly without any errors. With the METTLER TOLEDO P-50 line of printers, the meta-data, plus the date and time of the measurement, can be printed out alongside the results. How can I evaluate the measurement results of several samples? When you have a series of density determinations to make, the statistics option on METTLER TOLEDO balances enables you to quickly identify trends in your data assisting you to make decisions on a course of action where appropriate. Where can I find a table of density values? XPE, XSE, MS-TS, ML-T and ME-T balances have a built-in density database for the most commonly used reference liquids. The density value is adjusted according to the temperature you input. How can I avoid error in my density calculations? The density application on XPE, XSE and MS-TS balances does all the calculations for you. You only need to input the temperature and select the reference liquid used. The balance records the weight values and calculates the density automatically. How can I make documenting my density results easier? The density application on MS-TS, ML-T and ME-T balances allows you to create a report of your density determination series which you can print out or save on a USB stick. XPE and XSE balances in combination with LabX software offer a higher degree of report customization with graphs and charts, and the report can be sent straight to your LIMS or EPR. Measurement of density is an important quality parameter of both raw materials and finished products. Various techniques enable the density of solid, viscous and liquid materials to be accurately determined e.g. metals, plastics, chemicals, lubricants and food. A variation in a raw material, indicated by a change in the density, may have a detrimental outcome on the functioning or quality of the final product. Density measurement of raw materials can be used to confirm the purity of the material. If a substance has been adulterated with a cheaper alternative, the measured density of the composite material will be different from the pure substance. Density can also be used to ensure homogeneity. If a manufactured part is not homogenous, key performance attributes such as strength and crack resistance can be affected. For example, an internal air bubble could ultimately cause a part to fail when placed under stress. Random sampling of parts is a simple and cost-effective way to monitor ongoing quality. Common laboratory gravimetric procedures for determining density are the buoyancy technique, the displacement principle and the pycnometer method. The most widely used method is the buoyancy technique which utilizes Archimedes' principle: a body immersed in fluid indicates an apparent loss in weight equal to the weight of the fluid it displaces. This ancient principle, from around 200 BC, is precisely what is used nowadays to determine density gravimetrically. Accurate density measurement therefore is highly dependent upon accurate weight values. to the weight of the fluid displaced by the body. of which can be seen in the third decimal place of the result. Viscous samples require a viscosity correction (available in modern instruments). It's quite simple to weigh a sample accurately, but determining the volume of a sample accurately can be challenging. The buoyancy method avoids the problem of determining volume because it involves weighing the sample twice in two different mediums (air and a liquid). The volume can therefore be assumed to be constant in both situations. In the simplest application of the displacement method, the volume of a solid sample is determined by observing the increase in the level of the liquid in which the sample is submerged. Conversely, when an object of known volume is submerged in a liquid with unknown density, the difference in the weight values (in air and in the liquid) can be used to determine the density of the liquid. A pycnometer is a specially designed glass flask, usually with a defined volume. It is most often used to determine the density of liquids. The pycnometer is first weighed empty and then full of the liquid under investigation. The difference (i.e. the mass of the sample) divided by the volume of the pycnometer is the density of the sample. The pycnometer method can also be used for determining the density of powder samples or granulates. A hollow glass tube vibrates at a certain frequency. The frequency changes when the tube is filled with different substances: the higher the mass of the sample, the lower the frequency. Digital density meters work by measuring the frequency and converting it into density. Please see the table below for a comparison of these four different methods. a solid sample The sample is weighed once in air and once immersed in the auxiliary liquid with known density. Density of the solid sample can be determined from the known density of the liquid and the two mass values. ρL,= Density of air The auxiliary liquid with known density is weighed before and after immersing the sample (tare can be used to measure mass difference directly). a liquid sample The reference body with known volume (glass sinker) is weighed once in air and once in the liquid with unknown density. Density of the liquid can be determined from the known volume of the reference body and the two mass values. ρL,= Density of air The weight of the liquid with the unknown density is measured before (tare) and after immersing the reference body (gamma sphere or glass sinker). Using the mass difference and the known volume of the reference body, the density of the liquid sample can be determined. The pycnometer is first weighed empty and then again full with the liquid sample. The mass difference divided by the volume of the pycnometer is the density of the liquid. The sample is added to a U-shaped hollow glass tube in the device. The density of the sample is determined by measuring the frequency of vibration of the tube. The lower the frequency of vibration, the higher the density of the sample. 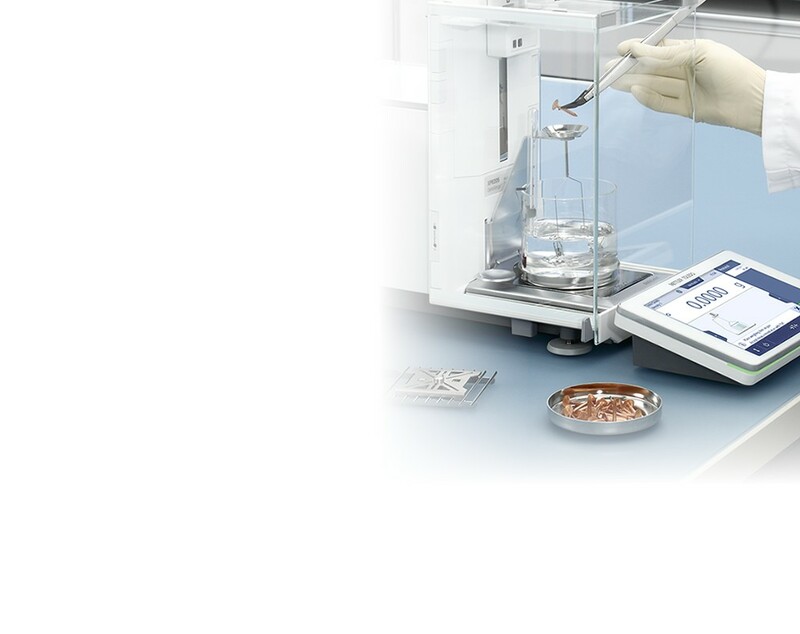 ISO 1183-1 specifies the use of a 4-decimal place analytical balance. Bulk density is a measure of how many particles, parts or pieces are contained within a measured volume. Bulk density is not a property of the material itself. Bulk density includes the spaces between the particles or items as well as any voids within the items themselves. Bulk density can vary depending on how the material is handled; shaking a container, for example, allows parts to settle, increasing the overall bulk density. Measurement of density is an extremely important quality parameter of both raw materials and finished products. We understand there are many factors which must be considered to ensure accurate density results. If you need support with density determination or want advice on which balance or Density Kit to purchase, our team of experts is here to help. Use a wetting agent or organic liquids (the density change experienced by distilled water by the addition of a few drops of wetting agent can be neglected). Solids are generally so insensitive to ambient temperature fluctuations that the corresponding density changes are of no consequence. However, as density determination is carried out with an auxiliary liquid, temperature must be taken into account. Temperature has a greater effect with liquids and causes density changes of order of magnitude 0.1 to 1‰ per °C. This effect is already apparent in the third decimal place of the result. To obtain accurate results, we recommend that you always take the temperature of the auxiliary liquid into account in all density determinations. Values are available in dedicated books of tables. The densities of the most important reference liquids (H2O and Ethanol) are stored in the balance. As mentioned above, weighing plays an important part in the accurate determination of density so it is critical that the balance used meets the needs of the density application. For small samples, the minimum net sample weight of the balance must be considered – weighing a sample below this weight cannot be trusted to be of the required level of accuracy. Manual transcription of sample data, weight values and density calculations is time consuming and prone to error. 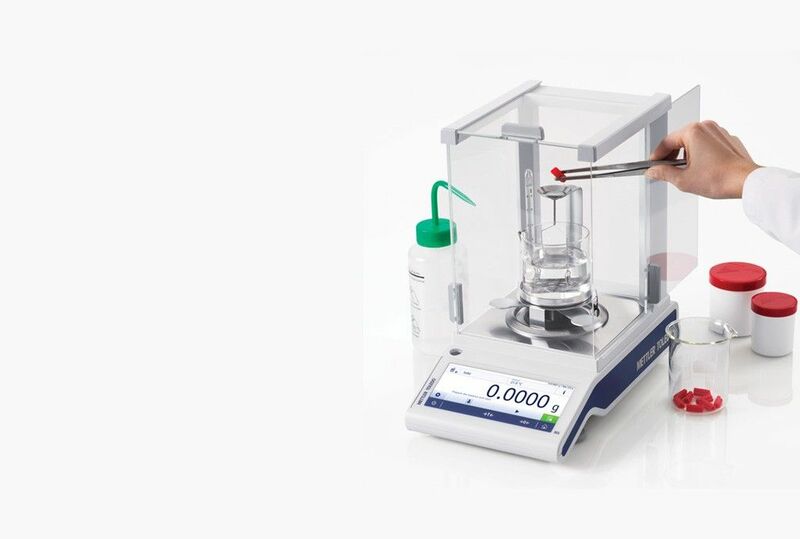 Most METTLER TOLEDO analytical and precision balances with 1 mg or higher readability can be easily used to determine density via the buoyancy technique with the use of a density kit which is mounted on the balance in a few simple steps. Density determination using a balance is an easy and convenient process that delivers highly reliable results when compared to other methods in which the volume of the part is determined independently of the weight. By converting a standard laboratory balance with the addition of a Density Kit, you avoid the necessity to purchase a dedicated piece of equipment to carry out this straightforward procedure. This makes the purchase of the Density Kit accessory a very cost-effective investment. With the addition of a glass sinker of known volume, the Density Kit can also be used for determining the density of liquid samples. All results, including User, Sample ID, Lot Number, Time and Date can either be printed or saved on a USB stick. For bulky samples, which do not fit into the Density Kit, METTLER TOLEDO precision balances with 0.1 g and 0.01 g readability can be converted to weigh below the balance through the addition of a dedicated hook. The density measurement principle is exactly the same; the sample is weighed in air and again in a reference liquid. 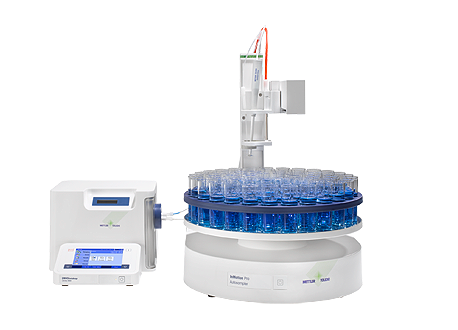 Watch how simple it is to measure density on your METTLER TOLEDO laboratory balance. The Density Kit enables you to determine the density of solid, liquid, porous and viscous substances. With step-by-step instructions and automatic calculations, the whole process is easy. Density determination is essential for consistent plastic quality. The application note describes how the density of solid plastic parts can be easily determined using the integrated application on a METTLER TOLEDO MS-TS, ML-T or ME-T analytical balance with a Density Kit. 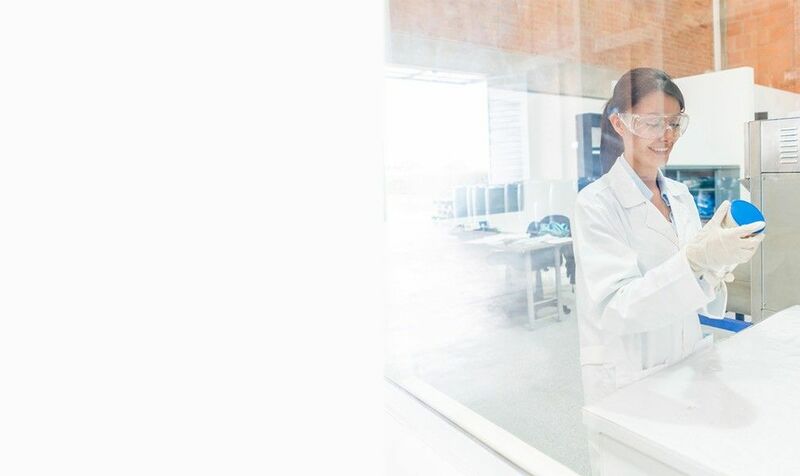 The combination of a METTLER TOLEDO Excellence level balance and LabX software offers a higher level of data management and process security. Excellence analytical and precision balances can be set up with a Density Kit for density determination. LabX ensures that your density SOP is followed precisely. LabX records all weight values, performs all calculations and saves all results securely in a central database. All the data related to your density application can be transferred directly to your internal data management system. If more than just the density is of interest, digital density meters measure density, specific gravity and other related attributes of liquid samples (i.e. alcohol%, BRIX°, API degrees) with high precision and short measuring time. Download the Free Application Note!